Snowbirds traveling to Florida's West Coast are treated to a 66-mile road trip along U.S. Highway 301, an old-time road that serves as a connector between one interstate system and another. Anne Sponholtz traveled U.S. Highway 301 as a youngster when her family vacationed in Florida each summer. Recently, when she set out in her RV to see what this rural section of highway in North Florida had in store for snowbirds, she discovered orange juice, pigs, a county seat, horse farms and a state park along the way. 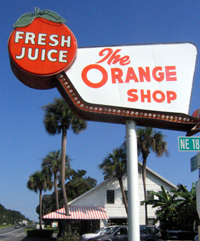 A popular stop for snowbirds along US Highway 301 in Citra, Florida, The Orange Shop features freshly squeezed orange juice, citrus fruits, and gifts. 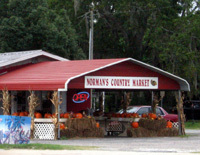 Small family-owned markets are a common sight alonh US Highway 301, selling produce, fruit, and often boiled peanuts, a Southern favorite. Starke is still the gateway to Florida's west coast for many snowbirds. The town's old courthouse, which now houses a community college, is a landmark of the town, which also serves travelers with restaurants, motels, campsites, and shops. The Waldo Farmers & Flea Market nine miles south of Starke is open Saturday and Sunday from 7:30 a.m. to 4:30 p.m.
Before Mickey Mouse took up residence in Florida, postcards contrasting Florida's winter weather with a winter day in the North were often used to attract snowbirds to the state, where picking oranges in short sleeves seems like much more fun than throwing snowballs in snowsuits. White sandy beaches and palm trees greet snowbirds traveling to Florida's west coast, a contrast from northern Florida's pine forests. My parents had it backwards. Growing up in New England, summertime meant packing our bags for a month in Florida. Our destination was Indian Rocks Beach, on Florida's West Coast, and in summer it was hot, hot, hot. More sensible Northerners pack up and hit the road for warmer weather in wintertime. Each year one million of these "snowbirds" get out their maps and set off on a road trip to Florida. One thing my parents had right was that our road trips to Florida took us on the back roads. Along the way we got to experience the sights, sounds and smells of America, rather than the concrete highways where turning every corner is like watching the same movie over and over again. Google directions to Florida's West Coast lead snowbirds living in Cleveland, Ohio, and all points east along a slew of interstate highways from the time they leave their hometown until they arrive at their destination. However, there is one 66-mile stretch where travelers are taken off the interstate system and directed onto U.S. Highway 301, an old road through rural North Florida. As a youngster, my family's final overnight stop was along this highway, at a motel in Starke. Even today, Starke, the county seat of Bradford County, is Florida's gateway to the West Coast. I am now a Florida resident, and U.S. Highway 301 is not far from my hometown. I recently packed up the RV and headed out to see what the old highway looked like today. I found much was the same. I was in Starke on a day when it seemed all the snowbirds were traveling home. Motor homes, fifth wheels and campers outnumbered the cars, and the diversity of out-of-state license plates drew a map of the snowbirds' home states. Snowbirds coming south are instructed to exit Interstate Highway 10 at the Starke exit. Numerous fast-food restaurants and a large truck stop greet weary travelers. Starke is 26 miles down the road. What awaits travelers along U.S. Highway 301 is far different from what they will find on Florida's West Coast, for Florida is indeed a coat of many colors. In North Florida, leaves change colors, winter temperatures can dip to freezing, and the roadway offers scenery of pine forests and pastures and railroad tracks and roadside produce markets and fresh vegetables growing on farmland and in gardens. "Pigs for sale," says one sign along the way. Many vestiges of the time when U.S. Highway 301 was the vibrant main route to Florida remain, with old motels and cabins that travelers once viewed as first-class accommodations now looking like they belong in the pages of an old travel brochure. U.S. Highway 301 takes you through the few blocks that mark Starke's business district. Here you will find traffic lights, restaurants, family-owned businesses, churches, motels, county buildings and the landmark Old Bradford County Courthouse, which now serves as a community college. A popular KOA campground is located on U.S. Highway 301 in Starke; some snowbirds find it to be a perfect stopover before traveling farther south, while others stay the winter. Just south of the downtown area is a Super Wal-Mart. 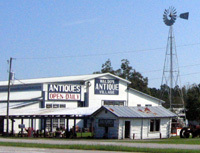 A few miles south of Starke is the Waldo Farmers and Flea Market, featuring Waldo's Antique Village, which is open seven days a week. Watch the speedometer in Waldo, as the town, like Lawtey to the north of Starke, is serious about speeders. If you have time for a side trip, take County Road 325 west when you reach Island Grove, 37 miles beyond Starke. Five miles down that road is Cross Creek, home of the Yearling Restaurant and Marjorie Kinnan Rawlings Historic State Park, where you can see the Cracker-style homestead where the famous writer penned much of her work. The house and farmyard were named a National Historic Landmark in 2006. Check the Web sites for restaurant hours and walking tours. Back on the highway, you simply can't miss The Orange Shop in Citra, the next small town along the way, where you can get a glass of Florida squeezed orange juice and spot some of the first orange groves. Orange groves are scarce this far north, as harsh winters over the decades have forced them farther south. The shop opened its doors in 1936; it now sells gifts and fruit baskets you can send to your family and friends who are shoveling snow. I've stopped there over the years and can tell you their orange juice is about the best I've ever tasted. The scenery along the rest of U.S. Highway 301 remains rural with mostly pine forests and a few pecan trees dotting the landscape. Then suddenly, just outside Ocala, it turns into rolling hills with breathtaking views of horse farms, where you might spot the next Triple Crown winner grazing. The journey off the beaten path has ended and it is time to hit Interstate Highway 75. The traveler leaves behind the old highway, trading the laid-back lifestyle of rural North Florida for the picture-postcard version of the Sunshine State with its white sandy beaches, blue Gulf waters, unforgettable sunsets, tropical plants, entertainment and attractions.